Are you always looking for delicious yet quick and easy meals to make throughout the week? If you’re like me, you just don’t have time most nights for a really good home cooked meal. You want to feed your family something tasty and healthy but do you really have the time mid-week to prepare something like this. With this crunchy honey chicken, you do. This recipe is so fast and easy to make and it is perfect for adding a little variation to your normal dinner routine. Chinese food is my favorite, although I rarely cook it at home. I tried this recipe on our “choose a different culture night” and I have to tell you, it was a huge success. Everyone in my family loved it and it really is so easy to make. It only takes about 10 minutes to prepare and then another 20 minutes to cook – how fast is that? You have plenty of time during your busy week to make this and it is filled with chicken and vegetables so it’s really healthy.If you want another quick and easy chicken dinner idea, try this cast iron skillet chicken pot pie. It really is a family favorite. 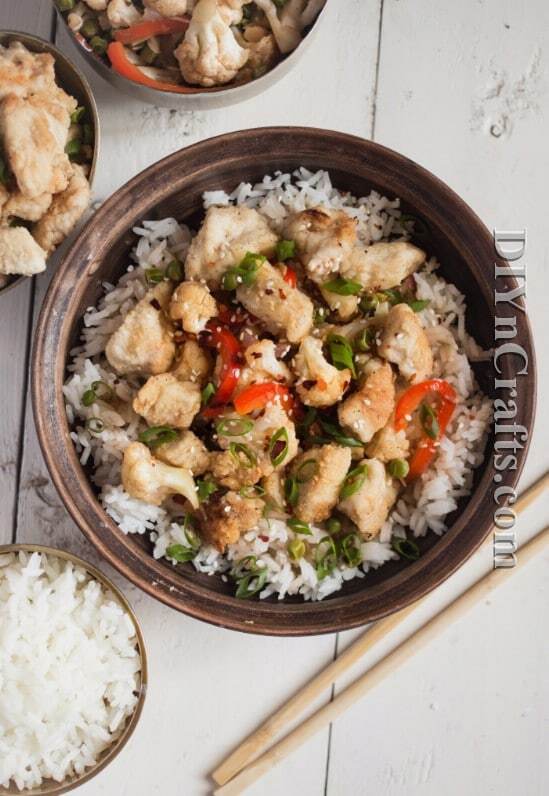 Even if you have never cooked Chinese food, you’re going to find this one so easy. You can serve it with any of your other favorite dishes or just whip up a nice salad to accompany it. It’s a very versatile dish and perfect for those busy nights when you really don’t have time to cook an entire meal. 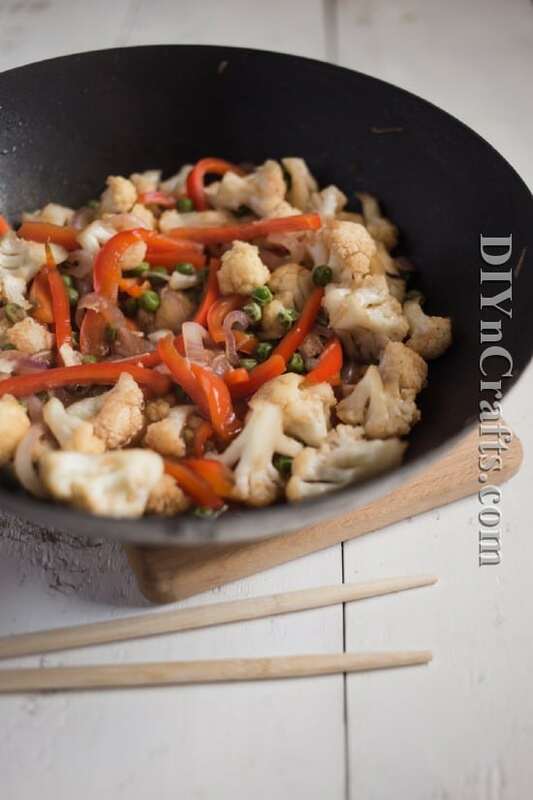 Soy sauce, honey and sriracha sauce give it a wonderful flavor with just the right amount of spiciness. You will love this dish – and your family will, too! And they will love it even more if you serve these chocolate chip cookies for dessert. They’re also really quick and easy to make. 1. Heat 1 tbsp. of vegetable oil in a wok over high heat. Add vegetables and fry them for 5-6 minutes, tossing all the way trough. 2. Mix garlic, soy sauce, sriracha and honey. Pour the sauce over the veggies, remove from heat and set aside. 3. Whisk egg with a pinch of salt. Combine salt with cornstarch. 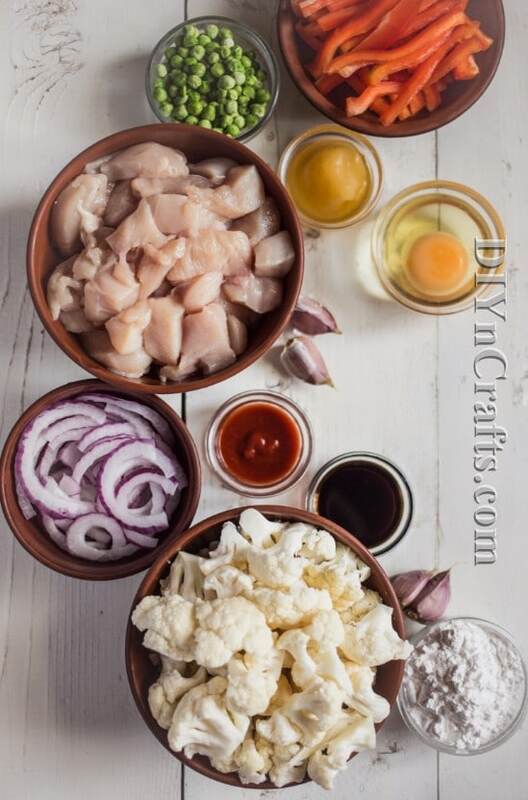 Dip chicken into beaten egg and toss in cornstarch. 4. Heat leftover oil over medium heat and cook chicken in small batches for 2-3 minutes or until crispy and golden. 5. Serve chicken and veggies over cooked rice, topped with chopped scallions. You want to feed your family something tasty and healthy but do you really have the time mid-week to prepare something like this. With this crunchy honey chicken, you do. This recipe is so fast and easy to make and it is perfect for adding a little variation to your normal dinner routine. Heat 1 tbsp. of vegetable oil in a wok over high heat. Add vegetables and fry them for 5-6 minutes, tossing all the way trough. Mix garlic, soy sauce, sriracha and honey. Pour the sauce over the veggies, remove from heat and set aside. Whisk egg with a pinch of salt. Combine salt with cornstarch. 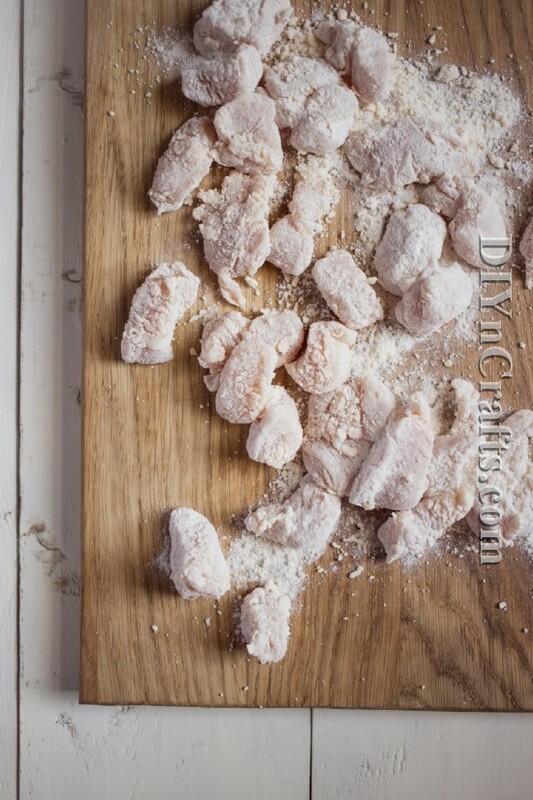 Dip chicken into beaten egg and toss in cornstarch. Heat leftover oil over medium heat and cook chicken in small batches for 2-3 minutes or until crispy and golden. 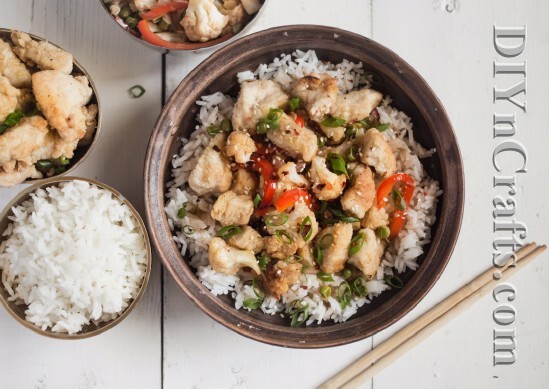 Serve chicken and veggies over cooked rice, topped with chopped scallions.